Feeling bored on a Friday night? Don’t want to go drinking and already ate dinner? Want to hang out with friends and eat popcorn and candy? Want to experience both childhood VCR nostalgia and see newly released films? Head over to the Marquee Cinema! The Marquee Cinema is on the second floor of Union South and screens films all week long during the school year with start times ranging from 6pm-12:00am. The films are chosen by the WUD Film Committee and they do an excellent job of showing a combination of old classics and new films. They show a wide variety of genres, from traditional horror and comedy to more abstract art films and obscure documentaries. And best of all it’s completely free. That is, unless you want concessions. But luckily the Marquee’s concessions are way cheaper than your hometown movie theater and you can even buy bulk treats at the nearby KwikTrip or local dining hall. If you’re feeling like trying something new and reliving old memories and great films check out what the Marquee is playing! 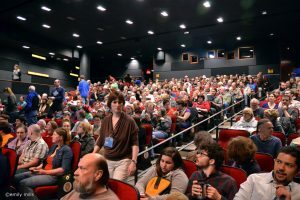 Head to https://union.wisc.edu/get-involved/wud/film/ to see what’s screening next.